How can this be? Why is it that the most snuggly, tranquil, ideal companions are in this situation? For starters, this happens to most senior dogs by no fault of their own. Confronted with financial pressures, illness, or another life upheaval, animal owners suddenly may be unable to care for their pets. Then, once older animals land in shelters, they can get overlooked because people think it will be too sad to bring them home. But wait! Not so fast! Our bestselling book “My Old Dog: Rescued Pets with Remarkable Second Acts” provides overwhelming evidence that adopting a senior can be even more rewarding than choosing a younger dog. In fact, it’s likely to go down in history as one of the best things you’ve ever done. Just ask Lori Fusaro, the photographer for “My Old Dog.” She once thought it would be too sad to adopt a senior — “I didn’t think my heart could take it,” she explained — until the day she welcomed a sweet-natured 16-year-old dog named Sunny into her family. Sunny transformed almost immediately from a sad shelter dog to a happy, beaming family member, and she thrived for more than two and a half years in Lori’s care. Seeing a dog feel so relieved and grateful and content is the best thing ever, and taking this step doesn’t have to cost as much money as you might expect. While it’s true that many older shelter dogs need veterinary care like dental work, people on a budget really don’t have to be too scared about this because there are a variety of ways to solve for it. It’s heartwarming and hope-inspiring to see just how many innovative approaches are popping up to help older shelter animals in need. Some organizations, such as Old Dog Haven in Washington state and Old Friends Senior Dog Sanctuary in Tennessee, pull older dogs from shelters and take care of any urgent veterinary needs, and then they place the dogs in permanent foster homes and continue to cover all veterinary costs for the rest of the dogs’ lives. In such situations, people who open their homes to these “final refuge” foster dogs never have to worry about a single vet bill. “Seniors for Seniors” programs are another wonderful provision offered by many shelters and rescue organizations. These programs match mellow older dogs with older humans, and they typically waive adoption fees and cover all initial veterinary and grooming expenses. Many “Seniors for Seniors” programs also provide free welcome-home kits with dog bowls, leashes, harnesses, collars, food, medication, dog beds, and more. Muttville Senior Dog Rescue’s Seniors for Seniors program in San Francisco is a stellar example of one such program. Even if people adopt senior dogs directly from shelters without taking advantage of any special programs or assistance, they can keep these cost-saving details in mind: With older dogs, it often doesn’t make sense to do high-dollar, heroic procedures such as lengthy cancer treatments. Instead, the focus is on helping dogs enjoy good quality of life, minimizing discomfort, and giving them lots of love. Of course, not everyone’s circumstances allow them to adopt or foster a senior dog — even if they’re crazy about dogs. But that’s OK, too! There’s still so much you can do to help a senior! Shelters and rescue groups always need volunteers in areas like animal caregiving, professional grooming, high-quality photography, marketing, fundraising, and administrative assistance like filing, paperwork and document design. If you have a special talent, why not throw one of these hardworking groups a bone? These organizations also are so grateful for financial support to help defray vet bills and other expenses for the animals in their care. You can donate money to specific, local senior-dog-rescue efforts that inspire you, or you can opt to help to a nationwide program such as The Grey Muzzle Organization. See? Helping a senior dog is such a great thing to do, and there are so many ways to do it! Please consider it, and please be assured that you’ll never, ever regret it. 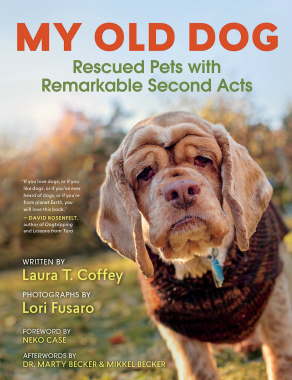 Laura T. Coffey is the author of the national bestseller “My Old Dog: Rescued Pets with Remarkable Second Acts,” with photographs by Lori Fusaro. (Incidentally, this happy book makes a GREAT gift for dog lovers and is on sale for half price from publisher New World Library until Dec. 20, 2017! Just enter the code “FRIENDS" at checkout!) Laura also is a Grey Muzzle advisory board member. Connect with her at MyOldDogBook.com.